The Kingsknowes Hotel is an imposing Scottish baronial mansion, built in 1869 for the local textile mill owner, Adam Lees Cochrane. It was sympathetically converted into an Hotel in the 1960s, managing to retain much of the delicate elegance and charm of the original features, and furnished comfortably with its heritage in mind. The Hotel has twelve individually furnished en suite guest bedrooms, including a family room, the Scott Suite and various other standard and superior double/twin rooms. Located off the A7, between Galashiels, Melrose and Selkirk, the Kingsknowes Hotel is situated in five acres of carefully tended gardens above the banks of the river Tweed. The view from the Hotel across the river takes in Abbotsford House, home to the 19th century novelist Sir Walter Scott, with a backdrop of the Eildon Hills. Only a 15 minute walk from Galashiels town centre and soon to have a rail link to Edinburgh. In the heart of the Scottish Borders, the Kingsknowes Hotel is ideally located for exploring many of the activities on offer. To name but a few, these include Golf, Fishing, Cycling and Horse Riding. Visit our Local Activities page for more information. The Scott Suite, popular with wedding parties, group bookings and for romantic breaks. It has views of the beautiful Eildon Hills and Abbotsford House, home of Sir Walter Scott. For every day and every meal, the Kingsknowes Hotel has something to tease your palate and make your stay a savoury one. Experience our menus, and all their specialties. 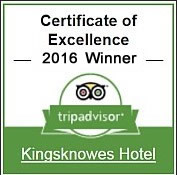 Kingsknowes Hotel is a specialist wedding venue and the quality of the food, service and organisation on the day reflect the substantial experience of our staff. Kingsknowes Hotel 4.5 out of 5 based on 70 ratings. Please advise us if you require any further assistance. We are always delighted to receive comments and suggestions from our guests. To contact us, please complete the contact form here: [Contact Us] or call 01896 758375 a member of the Kingsknowes Hotel team will be in touch as soon as possible.